Standing behind - MR Ajith Amarasekara, Director / CEO of Galaxy Landmarks, the EAP Group’s Property Development arm and Mr Kasun Jayawardena, COO for EAP Films and Theatres, Mr Kirk Edwards CEO of Village Cinemas. 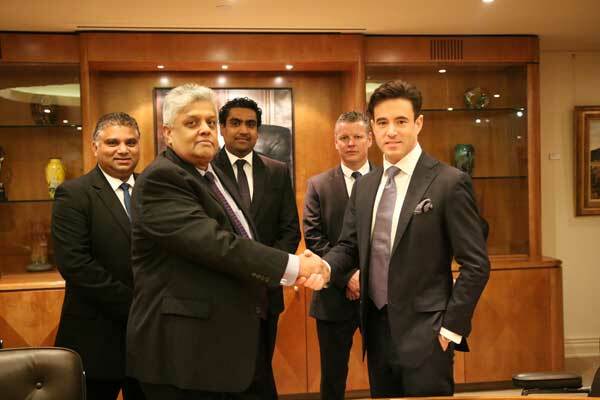 Tuesday 08th September 2015: Village Roadshow of Australia and EAP Group of Sri Lanka signed up an MOU through which Village Cinemas and EAP Films and Theatres Ltd will jointly look at opportunities to develop modern cinema multiplexes in Sri Lanka. Under this MOU both the companies are hoping to set up a JV in Sri Lanka, taking advantage of the Sri Lankan Governments incentives offered for multiplex cinemas. It is envisaged that the Sri Lankan public will be benefitted by world class cinema offerings in both content and facilities. Village is a world leader in the cinema industry with some of the best cine multiplexes on offer and is part of the Village Roadshow Group which also has interests in Theme Parks, Film Distribution and Film Production. EAP is a leader in the Sri Lankan film industry in Production, Distribution, Exhibition and Importation of films. As part of this MOU, Village Roadshow and EAP Group , also agree to explore other opportunities in Sri Lanka such as Theme Parks, Satellite Pay TV, Property, Digital Multimedia Advertising and other Cinema related value added revenue streams. The arrangements were negotiated by Mr Clark Kirby, COO of Village Roadshow Group, Mr Kirk Edwards CEO of Village Cinemas, Mr Mano Tittawella, Chairman/MD of EAP Group, Mr Ajith Amarasekera, Director/ CEO of Galaxy Landmarks, the EAP Group’s Property Development arm and Mr Kasun Jayawardena, COO of EAP Films and Theatres in Melbourne, Australia on Friday the 28th of August 2015.